For one week in May 2014, VOX magazine editor Ruth Garvey-Williams is travelling around Ireland to hunt down stories of faith, life and reality. Each day, she will share her journey and introduce the people she meets along the way. Visit VOX magazine on Facebook for more photos and to take part in our competition to guess how many miles she will travel this week! Day three dawned with blue skies and bright sunshine - perfect for the drive south from Wicklow and down through Wexford to New Ross. My first stop is with a small team from America, working alongside the local churches to help run a youth drop in centre and serve the community. It is great to meet Becky, Julieanne, Jody and Sarah and listen to their experiences over the last four months. Working with the local young people, they have been amazed at the spiritual hunger they have encountered. "We had a worship evening and one of the teenagers asked, 'Why does God allow bad things to happen?' You can't give cookie-cutter answers to such a serious question. It was great to be really honest with the kids," Sarah explained. And Julianne added, "One cool experience was watching one of the older teenagers teaching one of the younger girls how to pray!" While I'm in New Ross, I have the wonderful opportunity to chat with Ronan Johnston live on Spirit Radio - each morning I'll be checkin in with them at around 11.30 to share just a few of the stories from my travels. From New Ross, it was a short drive to Waterford city where I was to meet Paster Nathaniel from the Redeemed Christian Church of God along with Micah, one of the local church members. Nathaniel started the church in 2001 and it has gone from strength to strength, attracting a large number of "new" Irish (people from Africa and other parts of the world) as well as some Irish people from Waterford. The church makes a huge effort to connect and serve the local community and to build unity between different churches in the area. "On Easter day, we gathered at the nature park at sunrise (5.30 in the morning). There were close to 80 people from different churches all looking out over the city, singing and praying together," Nathaniel shares. "I believe the spiritual atmosphere in Ireland is changing rapidly. Before it felt like there was a lockdown - people were closed to the gospel - but now that is changing. But the only way to see that happening is through our unity, as we come together and pray together." Hearing stories Nathaniel and Micah sharing their own faith stories is so encouraging but time is pressing and I need to get on the road. As I climb into the car, they bring me an amazing gift - a basket of fruit! Next stop is the harbour town of Dungarvan where Holly, Lorita (with her two children), James and Polly from the local Christian Fellowship have gathered to share with me. I'm really struck by their passion for Jesus. "We don't want to be lukewarm in our faith," they tell me! As a rugby player, James first came into contact with Christians when one of the church members joined his rugby club. "I could see there was something different about him," James said. "I had a lot of questions. At times he probably wanted to tell me to get lost because I tried to test him. Eventually I asked to come along to church with him. The service shocked me because people were celebrating with smiles on their faces - they seemed happy to be at church." It took several years but finally James decided he wanted to have the same kind of relationship with God that he could see his friends had. "Finally I prayed, 'Lord I want to have you in my life. I want to draw close to you and let you guide me.' On the drive home I was singing! I felt such a sense of calm and peace." Time is short. 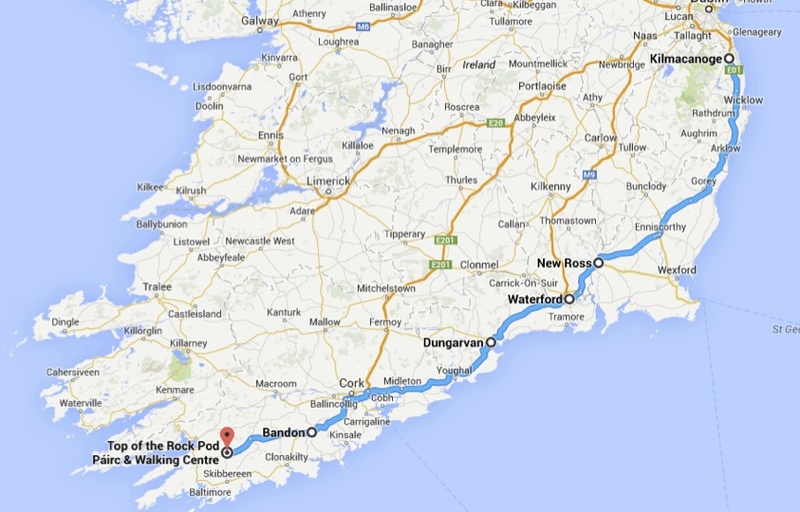 Once again, I'm on the road and this time heading for Bandon in West Cork. The drive seems long, especially through several downpours and I'm starting the feel the impact of three days on the road! Passing some incredible scenery, I'm a bit frustrated I can't drive and take photos at the same time! In Bandon, I have the privilege of visiting the Funky Fish cafe - a youth cafe run by a group of local Christians from different churches in the area. Keith Kingston manages the centre which is open five nights a week providing a safe place for teenagers between the ages of 13 and 18. On an average night up to 35 young people use the cafe and since its launch in 2006, the centre has connected with several hundred local teens. "We want to serve the community and to provide facilities for young people but at the core of the Funky Fish cafe is a desire to share the gospel with young people," Keith explains. "We don't promote any particular church but simply build relationship with young people and give them opportunities to find out more about God." There is just time for a quick coffee with Pastor Brian Synott from West Cork Community Church before I set out for Drimoleague - where I'll be staying overnight. As a Christian counsellor as well as a pastor, Brian has a huge heart for "broken" people. "I meet so many Irish people who are broken. When it comes to the gospel, superficiality won't cut it. People want reality. We are seeing people physically healed as we pray for them, but I believe the biggest healing we can see is the healing of the heart!" Journey's end for Day Three is the "Top of the Rock" Pod Pairc where David and Elizabeth Ross have developed an amazing walking centre at the start of an ancient Pilgrim route. I'm greeted with a feast - not only a lovely hot meal (much needed as it is already close to 9pm) but also a gathering of people from all over West Cork who are eager to share what God is doing. Raymond is helping to run all-age interactive worship times (based on the model of Messy Church) in Clonakilty and Skibbereen. Bernie, Sylvia and Heather are among a group of Christians who run "The Grace Centre" in Clonakilty - offering a Christian counseling service along with a wide range of services for the community, a weekly worship time and regular Alpha courses. Melanie, a school teacher and mother-of-four, shares her amazing journey as a new children's author whose first book will be published on June 1. Using two delightful ladybird characters, called Spottea and Dottea, Melanie re-tells Bible stories from a completely different perspective. Alan and Sally share about the work of the local Methodist church in Drimoleague where a bi-weekly children's club and an impromptu coffee morning are having an incredible impact across the whole community. And my hosts, David and Elizabeth share about the work of Bantry Christian Fellowship where a women's coffee and crafts morning and a weekly market stall are among a host of programmes that connect with the local community. Finishing the evening with a prayer together we all feel a sense of awe! The simple act of sharing what God is doing through ordinary people in different communities around West Cork has inspired and encouraged us all! It's another late night blog session with still more work to be done to download photos but I'm left feeling overwhelmed - it is truly beautiful to see faith in action, in and through the lives of so many people right across Ireland. Read DAY FOUR of the Finding Faith blog.